Bōjutsu is an ancient martial art (kobudō) which uses the bō as its weapon of combat and self-discipline. The bō is a staff or pole made of wood or bamboo, close to six feet in length, although it may extend to nine feet. Bōjutsu is a classical martial art which has been in use for hundreds of years. 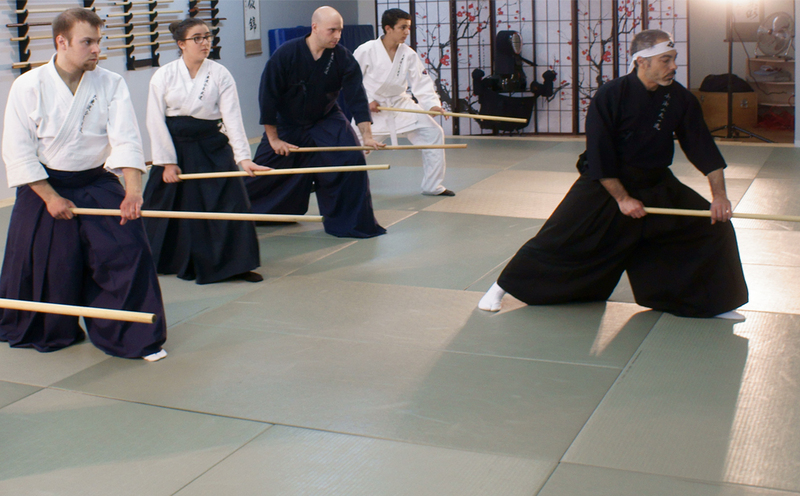 During Bōjutsu classes, Shihan Darwish begins instructions with a five foot staff. The staff may be simple in appearance, but its simplicity is a testament to its power. The bō’s power is its ability to extend and magnify an individual’s mental and physical strength through its length and compelling speed when used with skill. It can have devastating consequences on an opponent. As in any martial art training, the provenance and lineage of the craft is an integral part of the practice. Oral traditions assert that the classical techniques derive from the practice of Okinawan kobudō in the 16th Century; however, it’s likely that the varying techniques were in use by the Chinese people before it was introduced in Okinawa. Bōjutsu classes embody those traditions. Some believe that the forerunner of the bō was a simple stick (tenbin) which farmers used as a balancing implement across his or her back to carry water or crops in baskets suspended from the pole. It’s not difficult to imagine this tool emerging as a weapon for the defenseless poor who were prohibited from using better defined weaponry; however, the bō was a weapon privileged and perfected by samurai. Modern Bōjutsu classes integrate the same swinging, slashing and thrusting techniques used centuries ago. Those movements are used equally well without a weapon and so the hand techniques (te) are the basis for other martial arts such as karate. In that sense, competence with the Bō does carry through to other forms of martial arts. Although the application of Bōjutsu necessarily aimed to subdue an enemy in an aggressive encounter, the practice itself is beyond that goal. Like a police officer uses her or his weapon rarely in an unplanned encounter, the warrior learns throughout the Bōjutsu classes to use the bō in katas, in self-defense, and during exhibitions. It has been validated that objects used in this manner are incorporated as if they are part of one’s body. Bōjutsu classes are not about expressing violence and anger outwards but directing ones impulses into a discipline of the mind and body. Effective Bōjutsu classes confer the sense of wholeness, the integration of mind and body. With continued practice, the user senses a shift from being a tangled, scattered being to being present through fluid unconscious movement. The intensity of emotions become embodied in the discipline of the bō. Bōjutsu classes teach the mastery of self. It can be said that the practice is a meditative process, one that is exhibited in physical forms and postures.